I have such trouble with the back of a quilt. The front comes from an idea or a pattern. I have fun putting it together, and it almost always works the way I’d hoped. The back is hard because I feel that it should be as good or as interesting as the flip side. It should be worthy of being seen, not ‘just the back’. The three fabrics on top of front of quilt. Back of Kohala Koi quilt. There’s some interest, but they don’t steal the show. If the quilt ended up folded over or upside down it wouldn’t be a bad thing. The piecing is necessary because fabric isn’t usually wide enough to back anything more than 40″. Adding bits and pieces disguises the seams. Returning to the quilt of the moment – the colours of India. I bit the bullet and went in search of all new fabric for the back. I had great help in one of the local shops. The clerk and I found the perfect fabric, but when he went to cut it, we found a flaw ran through the entire bolt. (I was shocked when the manager said that she knew it was flawed, but was prepared to sell it at full price, without flagging it as flawed. hmmmm.) I had better luck at another shop and made my purchase. It’s been washed, dried and pressed. Tomorrow I’ll piece it and then, with Blake’s help, I’ll pin the top, the batting and the backing together. Then it will go away for a bit while I decide how to quilt it. I’ve just reread this post and feel a need to add a disclaimer of sorts. 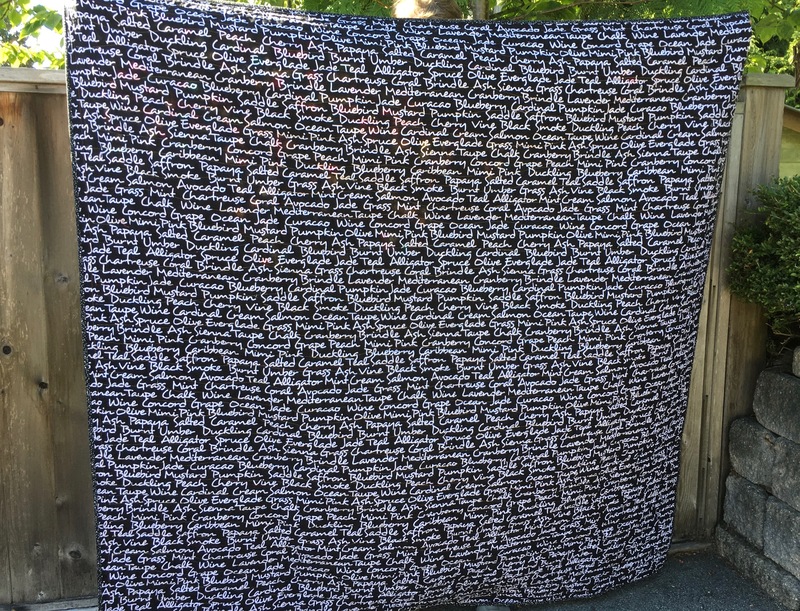 The back of this quilt won’t have different colours or fabrics. It will be all one fabric with seams that won’t be disguised with bits and pieces. What I’ve chosen just feels like the right thing, all by itself. There won’t be a third attempt. Stay tuned for the next post, which should be the final one for this project. It could be a while. 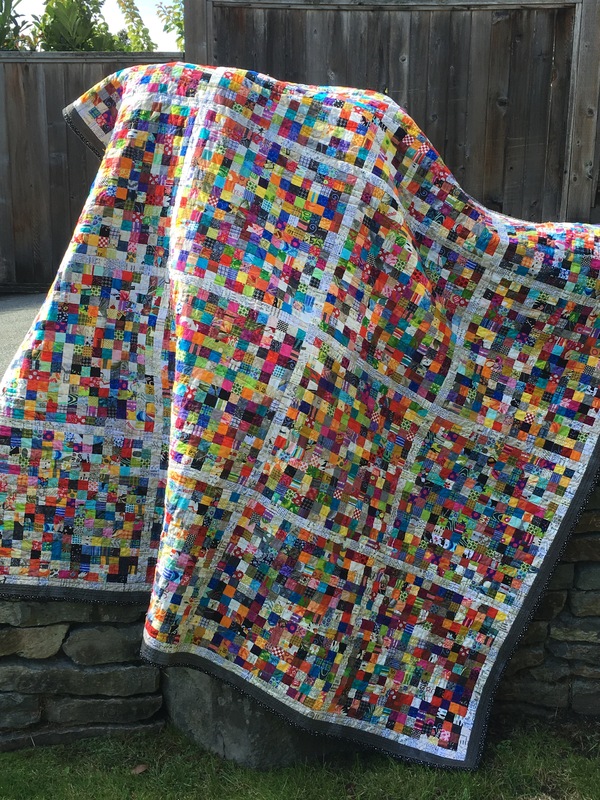 In the meantime, I’m trying to think of a name for this quilt, other than ‘Colours of India’. I like ‘Memories of India’ but President’s Choice has a line of marinades – ‘Memories of Korea, Szechuan, Tuscany, Argentina’ etc – so that won’t work. I welcome any suggestions. This entry was posted in Uncategorized and tagged India, own-design on April 2, 2016 by Megan Hanna. Happy New Year! I think I’ve got the blog organized to the point where I can start making regular posts. There will be lots of tweaking as time goes on, but let’s get started. I began sewing in junior high school. My Mom and Grandmother were both accomplished sewers, knitters and needle-pointers, so it was no surprise that I carried on with fabric-type crafts. I took home ec in high school and remember being called to the office to explain why my flannelette had hockey players on it, instead of fairies, princesses or other more feminine designs. Dare to be different, think outside the box – both describe my persona. This seems to have carried over to my new love of quilting. I want to use my imagination to create and don’t want to be restricted to a pattern. The quilt in the photos above was the sixth that I’ve made. I swim a lot in a pool. One day, while doing laps, I realized that the tiles on the bottom of the pool were laid out just like a quilt. I began collecting blue fabrics with a watery look. Armed with a large sheet of graph paper, a metre stick and some coloured pencils I drew up a scale version of three lanes of a swimming pool, complete with lane dividers. The fabric was cut into 2 1/2″ squares, sewn together into rows and then the rows were joined together. It didn’t look like much for a long time, but gradually it began to look like what I’d envisioned. I added a white border, used a mixed blue backing and a black binding. It’s machine quilted with a horizontal wavy pattern. I think this is my favourite quilt so far because it is an own-design that reflects my love of sewing and swimming. It’s very different and definitely outside the box! 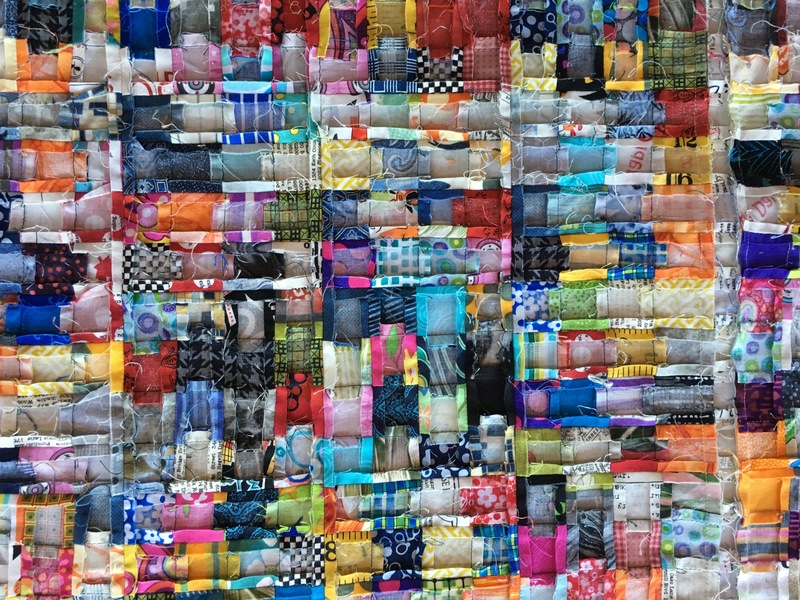 This entry was posted in Quilts - Their Stories and tagged imagination, own-design, swim on January 2, 2016 by Megan Hanna.